Ever since we got back from Peru, I've been in a little bit of a funk. Not wanting to leave the house, but no longer enjoying my favourite chair or finding our bed cozy. Sitting down with the laptop in my pj's with a good cup of coffee, and not finding anything to write. Finally thinking of funny stories and witty things to say, but when I start writing it down, it's gone or sounds stupid. I'm not too sure what's up. The cold, the rain, the tough getting back to reality maybe. If it wasn't for Noodle, I'd be a complete couch potato. But, Noodle won't let that happen. Insistently, loudly on occasion, he'll demand to go out, and it really is in our best interest to walk him for a good 2hrs a day, so we can get a few moments of peace and quiet in the house. He had a long walk yesterday, before I went back to blah and procrastinating, and it was time to go out again, as evidenced by his incessant need to bring his toys onto my lap, and the occasional whining and sighing by the door; such a drama queen. Off we went, walking around, until we got close to the dog park. I don't usually bring him when it's been raining, because it gets muddy and gross. But I don't know, maybe it was the funk, maybe the fact that it had been sunny before, or perhaps the sight of all the other dogs having fun, guilting me into feeling like a bad puppy owner. But I caved in, and to Noodle's delight, let him into the park. He met Marble, a cute Malamute puppy he first encountered when they were both tiny, and off he was running. They chased each other for a while, and I thought oh well, I'll just rinse his paws when we get home, at least he'll be tired. But then the wrestling started. And then the heavy rain. I was soaked, cold, and Noodle was a brown muddy disaster. So the working on my blog post became giving Noodle a bath, and time flew. 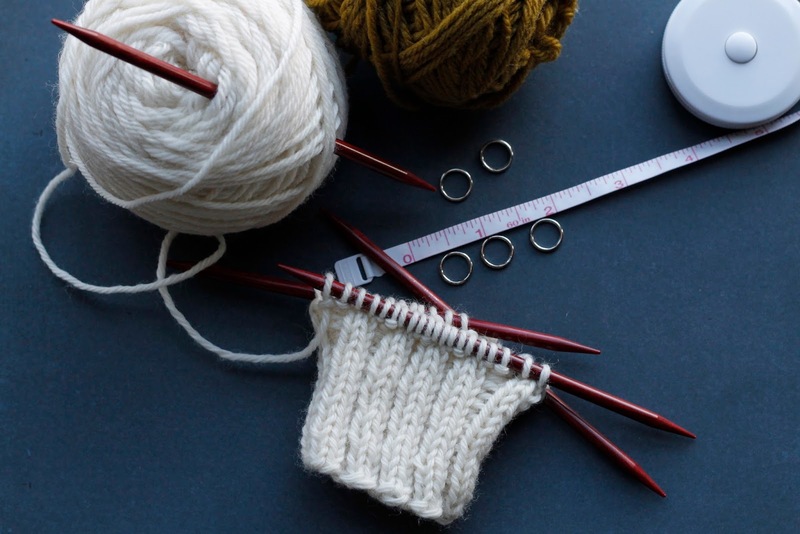 I've been procrastinating by letting my attention go from one website to the next, meaning that, amongst other things such as keeping track of Olympic medals, I've been reading a lot of knitting blogs. I've become progressively more aware and scared of the stashing problem that seems to be inevitable with knitting and crafting in general. At some point, I had to acknowledge that I was spending more time looking up new pattern ideas than actually knitting, and while my project list was increasing, my stash of yarn was staying pretty full. I started wondering to myself what would happen, as the yarn kept pilling up in our small loft, and imagined coming home to my yarn stash having fallen over, and Noodle in the middle of tangled and chewed-up pieces. Horror. The second project I decided to make after learning to knit a basic hat was mittens. I thought that I should also try cable, because they look so cool, and I settled on a cable mitten pattern that appeared to require modifications. Still, I didn't think that I should give up or pick something different. Obviously, it was a disaster. A few months later, I tried out mittens again, and made a pair that was mostly a success. I don't particularly like to read instructions, often preferring to just skip to the trying it out part, assuming that I can reason it on my own, which doesn't always work out. Graham, on the opposite, loves to read instructions, so between the two of us we usually can figure most things out. 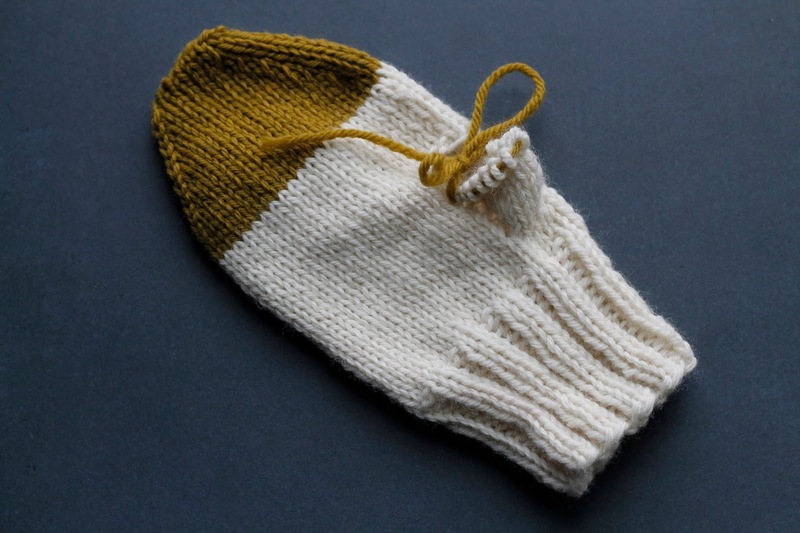 But I missed at step in my mitten pattern, which probably wouldn't have happened if I had read it first. I later made a few more pairs for friends, this time carefully following the pattern, but didn't have any for myself. I decided that I needed a weekend project, one that I would commit to start and finish in a timely matter, something productive to get me out of this funk. A fun and useful project, new dipped mittens to protect my hands from the cold on long walks with Noodle. I succeeded, and absolutely love them. 2 colours of worsted weight yarn. I used Cascade 220. You will need less than half a skein for the main colour (white in mine) and less than a quarter of a skein for the accent colour (mustard in mine). Using the long tail method and your main colour, cast on 40 stitches, divided into 3 needles as follow: 20, 10, 10. Join together, being careful not to twist. [Knit 2, Purl 2] for the next 2 1/2"
1st rnd: knit 1, place marker, make 1, knit 4, make 1, place marker, knit to end. 3rd rnd: knit 1, slip marker, make 1, knit 6, make 1, slip marker, knit to the end. 5th rnd: knit 1, slip marker, make 1, knit 8, make 1, slip marker, knit to the end. 7th rnd: knit 1, slip marker, make 1, knit 10, make 1, slip marker, knit to the end. 9th rnd: knit 1, slip marker, make 1, knit 12, make 1, slip marker, knit to the end. 11th rnd: knit to marker, slip the next 12 stitches onto the piece of scrap yarn using the darning needle and removing the markers. Tie a knot to secure. Cast on 4 stitches, knit to the end. 1st rnd: knit 15, place marker, make 1, knit 4, make 1, place marker, knit to end. 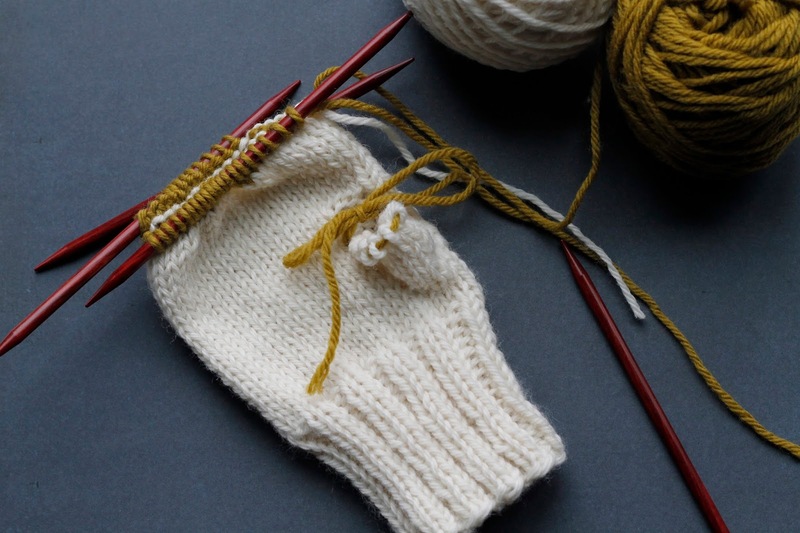 Continue to knit all stitches until an inch from the tip of your little finger. 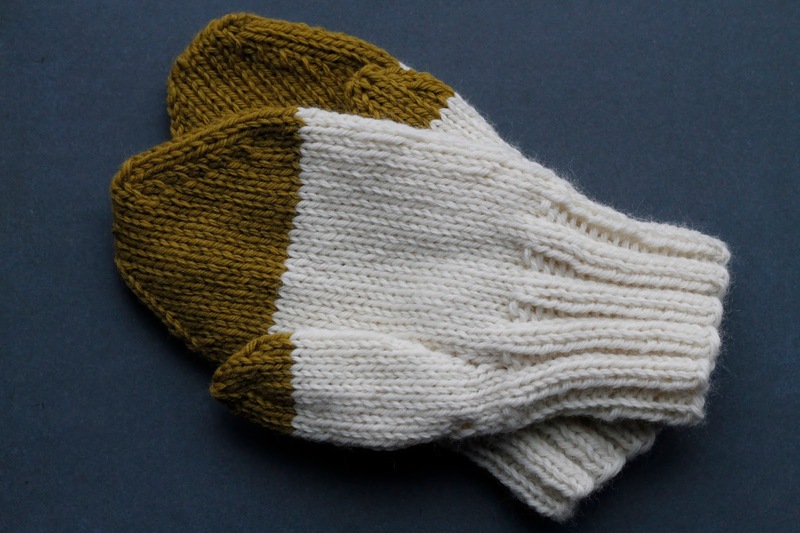 Change to the contrast colour, and knit all stitches for an inch, or to the tip of your little finger. 1st rnd: (1st needle) knit 1, slip slip knit, knit to the last 3 stitches, knit 2 together, knit 1; (2nd needle) knit 1, slip slip knit, knit 1; (3rd needle) knit to the last 3 stitches, knit 2 together, knit 1. Repeat these two rounds (including the knit round) until you have 16 stitches left. Divide the stitches so you have 8 stitches on 2 needles. Weave using the kitchener stitch. 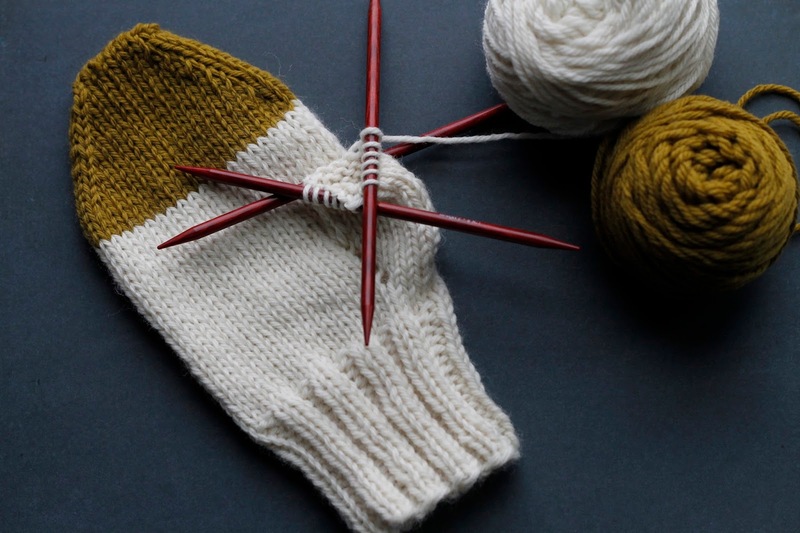 Check out this great tutorial from Purl Bee if you aren't familiar with it or need a refresher. Return the 12 stitches from the scrap yarn onto 2 needles. Use a 3rd needle to pick up 4 stitches from the palm. 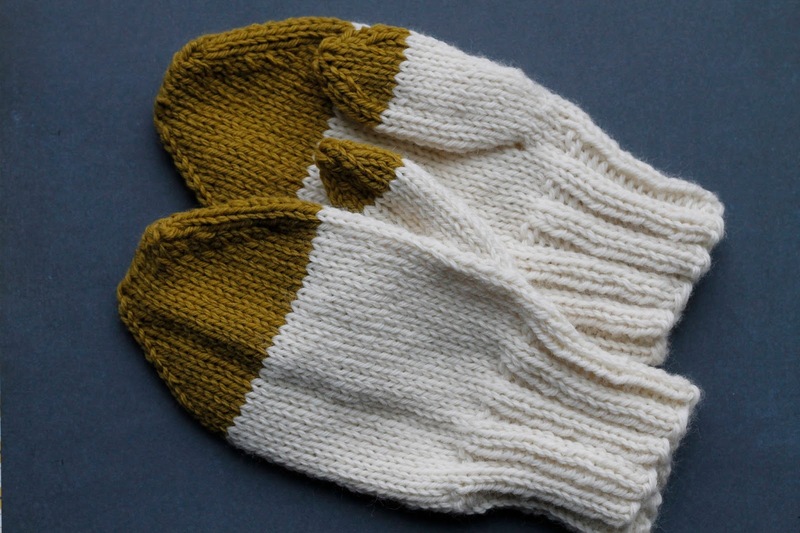 Using the main colour, knit all stitches until the top of your thumb knuckle. Change to the contrast colour, and knit all stitches for 3 rounds. 1st rnd: knit 2, knit 2 together. Repeat until the end of the round. 3rd rnd: knit 1, knit 2 together. Repeat until the end of the round. Cut the yarn. Using the darning needle, pull through the middle of the remaining stitches tightly.